For the benefit of anyone who hasn't already heard the news, two children (ages 11 and 13) were shot and killed in their home on Mansfield last Friday. Their 23 year-old cousin Ronel Thompson was also shot in the home but survived. 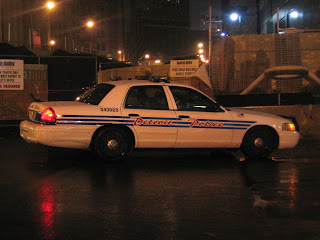 Detroit police found approximately $6,000 worth of cocaine in the home and believe that the adult cousin was a dealer. Six suspects have been arrested in connection with the shootings, all had convictions on their record for drug related offenses. According to this morning's newspapers, one of the suspects wasn't supposed to on the streets. He was released from the Wayne County Jail ten days earlier when he should have been transferred to the Macomb County Jail where he was scheduled to serve a two-week sentence for fleeing and evading the police. A few thoughts come rushing to mind in the aftermath of this madness. It's really that simple. Drugs don't just kill the users they also kill the drug dealers when they get into fights with rival dealers. More importantly, drugs kill those who get caught in the crossfire - such as the two children who were shot last week. The second thought that comes to mind from this is that because drugs kill people who were simply standing in the crossfire, it is imperative for the police to intervene; arresting drug dealers and users before shootings like this happen. The fact that enforcement has been so relaxed for so long has turned Detroit's neighborhoods into a virtual Wal-Mart for drug dealers - a place where they can ply their illicit trade with little fear of prosecution. The fact that Detroit's Warrendale neighborhood is bounded on two sides by Dearborn and on a third side by Dearborn Heights, plus the fact that there is a freeway running through the middle of our neighborhood, means that suburban drug customers can easily come into the neighborhood to make their buys and then quickly leave. The one bit of good news to come out of this shooting is that I have seen a dramatic increase in the number of police officers in the Warrendale neighborhood. Last night, while waiting for a bus, I saw three police cars and one police van along W. Warren Ave. Shortly after getting on the bus, I saw another police car - bring the total to five Detroit police vehicles that I saw in the Warrendale neighborhood within the span of approximately twenty minutes. I have lived in the Warrendale neighborhood for years and have never seen five DPD vehicles in one day before, let alone within the span of twenty minutes. I have seen that many downtown several times, but never in the neighborhood. This increase in police patrols is not without its benefits. I usually see three or four drug deals happen every week. In the past week, I haven't seen a single one. I'm thrilled that the Detroit Police Department is stepping up its patrols. However, I'm sad that it took the deaths of two children to bring it about. I had to add that I, too, have seen more cops on Warren Avenue. But, where we need the DPD is in the neighborhood, not cruising up and down Warren all night. I also saw four or five DPD patrol cars, both marked and unmarked, on one evening coming home from work. That same evening within two hours of me getting home, my airbags were stolen from my car. My lock and door were damaged in th act as well. I'm sorry, Frank, but this time you cannot say it was because of cuts to the DPD. It's their apathy which keeps them from driving through the neighborhoods. The same apathy which keeps them from arresting hookers and johns on Warren Avenue. We have both seen four or mores vehicles at one time, there is no shortage...It's pure laziness...What a joke Warrendale has become; it's a damn shame. ITS POOR MANAGEMENT, THAT COMBINED THE 8TH AND 6TH PRECINCT INTO ONE..CUTTING THE NUMBER OF JAIL CELLS IN HALF, THE NUMBER OF COMPUTERS IN HALF, THE AMOUNT OF SPACE NEEDED TO FUNCTION PROPERLY IN HALF - THE PRECINCT BUILDINGS IN DETROIT WERE NOT DESIGNED TO HAVE 400+ OFFICERS IN THEM..
POLICE OFFICERS CANT ARREST PROSTITUTES AND JOHNS BECAUSE THEY HAVE - NO - JAIL SPACE TO PUT THEM..POLICE ARE NOT ARRESTING PEOPLE BECAUSE OF THE LACK OF JAIL SPACE AND THE PAPERWORK (CRISNET REPORTS) THAT TAKE UP MORE TIME.. I SPENT YEARS SPEAKING OUT ABOUT THE MISMANAGEMENT WITHING THE POLICE DEPARTMENT, THE NEPOTISM, FAVORTISM AND CROYNISM..
NO ONE LISTENED..NO LOOK AT HOW THE DEPARTMENT IS PLACING THE LIVES OF DETROIT RESIDENTS AND POLICE OFFICERS IN GREATER DANGER THAN EVER BEFORE..
MY GARAGE WAS BROKEN INTO 5 TIMES IN A MONTH..
DETROIT POLICE NEED BETTER LEADERSHIP..THEY NEED A NEW POLICE CHIEF - THRU A NATIONAL SEARCH - FOR THE BEST AND BRIGHTEST..
DETROIT POLICE OFFICERS THAT STRUGGLE AGAINST A BAD DEPARTMENT.. I have several comments to add but I am a little angry right now so I'll simply let you all know what I just found out.....A Detroit Police Officer just let me know that he is allowed 700 MINUTES to respond to a complaint that is NOT weapons related. This morning, one of my neighbors decided to pick a fight with several of the surrounding neighbors (me being one of them). This woman said "I'll kill you you damn white trash", "I'll burn your houses" and "I'll poison your dogs". I called the police at 8:30am and they finally responded at 12:30 this afternoon. When I questioned the response time, I was told that they are are given 700 minutes to respond. The next time I call them, I will definitely tell them that there is a weapon involved....and quite honestly, I hope that weapon that I speak of is not mine! It is unfortunate that this neighborhood is going to hell in a handbasket and although we keep fighting - it seems that we are loosing. I had enough today and called the Ombudsman's office for the City of Detroit. They were somewhat helpful in helping me file a complaint but they also let me know that I should call all of the news channels to get this ongoing problem publicized. Isn't that a sad thing....a city worker telling me to further expose the Detroit problems! I am happy to report though - that I just looked outside and see a U-Haul at this idiots house and she is moving out. Hmmmm - another vacant home in our neighborhood. I guess I'll keep the grass cut at the house so it does not attract the many hookers, squatters and drug dealers. After all, there is a group home across the street from me and I know it's only a matter of time before they are at the vacant house smoking crack! Oh well, maybe they will stop doing it on their front porch for all to see! Maybe the guy who lives behind me raising fighter pit bulls will find out the house is vacant and lock his dogs up in there hooked to huge chains with padlocks around their necks! Again, it is sad that we have to deal with all of this I DON'T WANT TO LOOSE THE BATTLE, I have been here for 15 years and I will keep fighting if it kills me.....and it probably will!!!! Have a good day and if you have any suggestions for any of my neighborhood issues, please feel free to call me at 734-634-9689.